Beautiful Lamps. Very good quality and a much nicer in person than the pictures. Convey the beauty of carefree coastal living with the Nikki Sea Shell Lamp from Safavieh. Its classic gourd shape has been modernized with the sheen of a capiz shell mosaic in pearly tones. This iridescent piece has a range of colors, from off-white, to pink and brown, ensuring that it can blend seamlessly with existing motifs in your home. Topped with a crisp Geneva white drum shade, this ornate piece will illuminate the room. Place the pair of lamps on side tables in your spare bedroom to let guests relax in comfort, or use them on end tables to create a serene ocean-inspired decor. Beautiful lamps! Iridescent shell tiles are very attractive, the shade is a pleasant off white color. Easy to assemble. Very pleased with this purchase. I was hoping the shells would have variation in color and character. They are beautiful, and they are seamlessly installed on the lamp bases. Very finished looking, and the finials at the top are clear balls, very stylish. 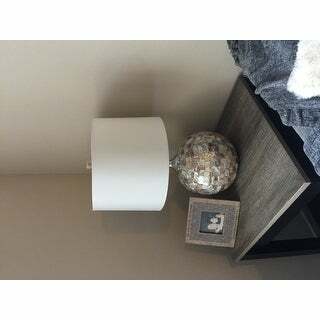 I was a little worried that the two lamps wouldn't completely match, because of the natural shell colors and random placement, but they do match and they look great together on the nightstands. We have gotten lots of compliments on them. 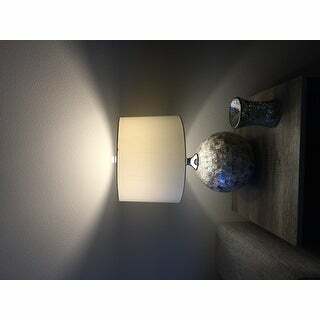 They were packaged well and the lamp shades are nice and high quality. These lamps are a perfect size to go on nightstands in your bedroom. They are too short for end tables. I love the shell motif that compliments my coastal design in my home in Florida. The color is neutral and will literally go with any color of walls and bedspread. I have had these two lamps now for over a month, and I am very happy with them. They are on my bedside tables. I think they are beautiful. I appreciate the subtle variation of colors in the shell covering. At first, I wasn't sure I'd like these lamps, but now, I love them. I thought maybe they looked too "beach cottagey" for a Pacific NW locale, but actually, they give a light-hearted look to the bedroom. The mixture of colors in the base -- light grey, beige, white -- make it easy to coordinate with many different colors. The bases are not real large, which is perfect for a smallish bedroom bedside table. We got two for my daughter bedroom. We lave the multicolored white-pink-light browns base. The lamp matches description. I like the simple, clean design with good proportions and the soft, bright light. Very easy to put the two lamps together by myself in just a couple of steps and less than 5 minutes. These lamps are gorgeous! I actually split the pair up and used one in the living area and one in a bedroom. Fabulous for a beach house. Shell pieces are beautiful. Highly recommend! Nice quality and good illumination. Used in a guest bedroom decorated in a beach/ocean theme. I was surprised how nicely packaged they were! It looked as if only one was in the box (judging by the size) but there were two nicely snugged in there! Not damaged and it came with light bulbs. One thing that is nice you can adjust the wire by stuffing it back into the stand; if your plug is close by you won't have a super long wire. Very elegant just like the photo. Provides a very soft white lighting. Beautiful lamps!! Quality made, and size is perfect for night stands, foyer or living room! Assembly was simple! 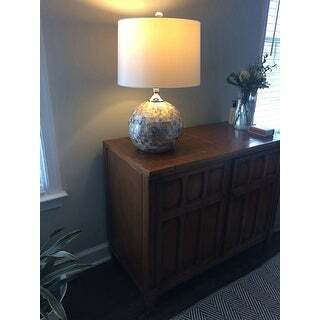 I've been looking for shell lamps for years and just got lucky I found these here at Overstock. They are the perfect size, exactly what I needed. Love these lamps. Have received many compliments. They are packaged very well so no fear of damage. These are nice lamps. A bit smaller than I thought, but they work well and look good. These are great and worked well as guest bedroom lamps. They might be just a big for nightstand lamps, but worked well for our room. Absolutely love these lamps. They go perfectly with our beach decor. Well made. And pretty to boot. Would definitely recommend them to a friend. These are beautiful and look great in our master bedroom. They were shattered in shipping and overstock replaced them promptly. Classy, high quality, and not the "usual" lamp. I opted for these because they are unique and appeared to be of good quality. They are even nicer in person. These are very pretty and quite a bit larger than I expected. Have to say I have purchased several lights from Safavieh and I'm always impressed. They were well packaged and even came with light bulbs. Perfect accent to my room. Very elegant and timeless. the size and color matched my dÃ©cor, Safavieh is good quality, the price was half of what similar products cost. Redecorating beach property bedroom and thought these would be perfect to set off colors and textures. "Is the base of the lamp 14 inches in diameter or is that the size of the lampshade?" Hello mia72513, The Lampshade is 14 inches in diameter, so the 14 inch dimensions is given as the widest dimensions on the lamp. Thank you for your questions. 14" is the shade....the base is closer to 8-10"